It's not whether you win or lose, it's how you look when they take your picture. For 25-year-old Zeddie Little of New York, an affable smile amidst the pain of long-distance running that was captured during a 10k race in Charleston, S.C. turned him into a viral phenomenon knows as "Really Photogenic Guy." Nearly 1.4 million people have viewed the picture in recent days on Flickr and it has been uploaded countless times to social media sites like Facebook and Twitter. A South Carolina systems analyst named Will King was looking through his photos of last weekend's Cooper River Bridge 10k when he stumbled across the one above. He noticed how different Little looked than all the other runners and uploaded it. "One of my friends commented on the picture and said something along the lines of 'I dub this guy Mr. Ridiculously Photogenic,'" King told the Post and Courier . "I thought it was a pretty cool comment, so I posted it on Reddit. For some reason it just took off from there." The nickname sounds like one the characters on "Friends" would have bestowed upon a handsome neighbor. 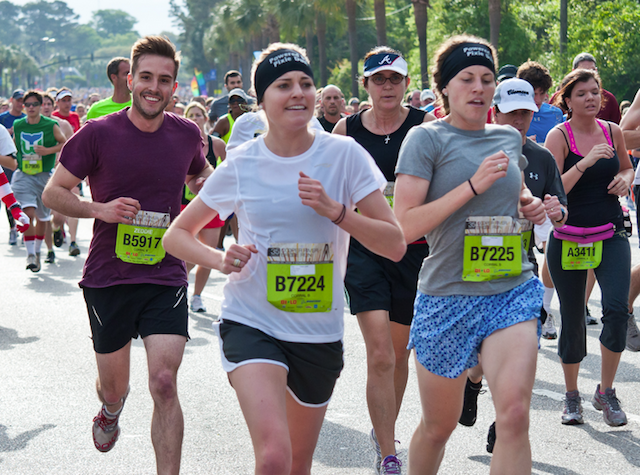 The juxtaposition of Little's smile and the rest of the runners is what makes the picture so amusing. Photoshop him out of that shot and put him in a family photo at Disney World and Little doesn't look any more "ridiculously photogenic" than anyone else. But while running a 45-minute race in the spring heat of South Carolina? Yeah, that's a photogenic guy.